Both the men’s and women’s track and field teams head to the Missouri Valley Conference Indoor Championships as underdogs, ranked sixth and fifth in the pre-championship polls. Wichita State, Indiana State and Illinois State are first, second and third for both. Senior thrower Josh Freeman said he is sick and tired of finishing behind Wichita and Indiana State. The Sycamores and Shockers men have finished first and second the past three indoor seasons after SIU won in 2012. The SIU men are the only MVC team, men or women, in the latest national rankings by the United States Track and Field/Cross Country Coaches Association poll, which has the Salukis at No. 24. SIU has 20 athletes in the top five of the Valley for their respective events, which is fifth in the conference. Wichita leads with 41 followed by Indiana with 29. Freeman, senior thrower Brad Sauer and junior jumper Kyle Landon are among five event leaders for the Dawgs heading into the championships. Their total is tied with Northern Iowa for fourth in the Valley. Illinois State leads with nine. Freeman — who won indoor and outdoor shot put last season — said scoring for the team is the top priority. The senior’s conference-leading shot put of 19.67 meters is No. 7 in the nation. He leads Indiana State senior Jamar Brown by less than two meters. A championship in shot would be Freeman’s sixth in four years. He has three in outdoor shot, one in indoor shot and one in discus. Freeman is also competing in the weight throw, where Sauer enters the championship with the lead. Sauer’s throw of 22.06 meters, seventh in the nation, is nearly two meters better than his runner-up finish last season. His mark of 20.39 meters was 0.40 meters behind teammate Curtis Wideman, who won the championship. The Carbondale-born senior said winning his first conference event would be a relief after injuries slowed him down before. Wichita is led by second-place senior Taylor Goldsmith — who finished third last season, 0.08 meters behind Sauer — with a throw of 20.77 meters. The Shockers also have the third and fifth place throwers going into the meet. Sauer’s teammate sophomore Isaac Ingram is in fourth with a distance of 19.91 meters, and Freeman is tied for seventh at 18.36 meters. Sauer said beating the Wichita athletes is a source of pride for him. SIU also has Landon leading the conference and is sixth in the nation for high jump with a height of 2.24 meters. He is attempting to win his fifth high jump MVC title in as many tries after sweeping indoor and outdoor his freshman and sophomore seasons. Landon said he is right where he wants to be for high jump. “It is one of those events where I’m really comfortable doing it so I don’t stress about it,” he said. Landon has also competed in the triple jump and long jump this season. He is third in triple with a distance of 14.59 meters, which leads the Salukis. Landon’s 6.93 meters in the long jump is 10th in conference and third on the team. He said he has been working his whole career to win a conference title in triple or long jump while also competing in high jump. 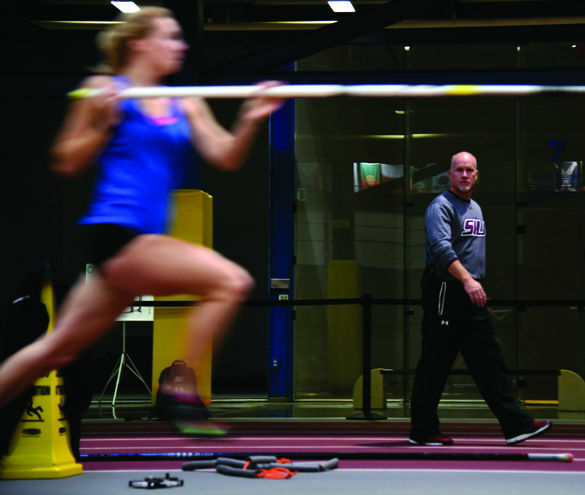 On the women’s side, SIU has event leaders in shot put and pole vault. Senior thrower Alexus Scott leads shot put with a throw of 16.43 meters, good for No. 29 in the country. She said having the conference lead going into the conference meet as a senior includes some pressure, but she’s relaxed. This would be Scott’s first MVC title. She finished All-MVC in the shot put as a sophomore. The last event leader is junior pole vaulter Cara Engel who enters the event with a height of 4.06 meters. Jumps coach Terry VanLaningham said he and Engel have not discussed going into the meet with the lead. Engel has a 0.06 meter lead over Indiana State senior Kimyanna Rudolph. Fellow junior pole vaulters Katie Trupp and Kacy Murphy are fourth and sixth in the Valley entering the meet. The meet begins at 6:15 p.m. on Saturday in Cedar Falls, Iowa. This will be the ninth year in a row the meet is held at the UNI Dome, and the 10th time in the last 11 years.